In August 2015 a Hawker Hunter jet crashed into a queue of traffic on the A27 motorway on the south coast of England, killing 11 men as they sat in the stationary vehicles. Pilot Andrew Hill has told a jury at the Old Bailey in London he has no memory of the day of the crash at the Shoreham airshow, near Brighton, on 22 August 2015. "You don't remember taking off?" His barrister, Karim Khalil QC asked him on Thursday, 14 February. "No….I only have a memory up until the 19th," Hill replied. "When is your next memory?" Mr Khalil asked. "I remember being woken up in hospital," Hill replied. Hill, 54, denies 11 charges of manslaughter by gross negligence and it is his case that he must have blacked out during the manoeuvre, probably as a result of the severe G-force. More than a dozen relatives of the victims listened intently in court as Hill said he suffered one "measurable injury" but was otherwise completely physically recovered from the crash, after he was miraculously thrown clear of the wreckage. "Have you spent any time trying to piece together what happened?" Mr Khalil asked him. "Most of those three and a bit years I have spent trying to resolve what happened," Hill said. "Was that easy?" Mr Khalil asked. "No. It was a dreadful tragedy for the people involved and I was the pilot. I was in charge of the aircraft," Hill said. ​Hill said he had pored over footage of the Shoreham crash. "There are very clear opportunities to make an escape manoeuvre or an alternative," Hill told the jury. "And you did not do that?" Mr Khalil asked. "I did not. I don't know why I didn't. I know what the aircraft did but I don't know what I did. But to do an escape manoeuvre you have to know what the intention was," Hill said. "I can identify a point where everything is going well," Hill told the jury, "but at the same point in time everything becomes anomalous. I can't understand it," he added. Mr Khalil asked him to explain what had actually wrong, even though he has no recollection of the incident. Hill said from the video and from other data he could see the plane's RPM started to increase aT 12.21 and 49 seconds, as it went into the bent loop. "But then the RPM very significantly and rapidly reduces, or I reduce it," Hill said. He said when the Hawker was at "full power" it was 8,100 rpm but he said because it was a 60-year-old aircraft he tended to consider 7,800 rpm was full power. But Hill said the jet started to go off its line and decelerate because full power was not maintained. "It's a reduction in power. Why did I take the power off?" Hill asked rhetorically. 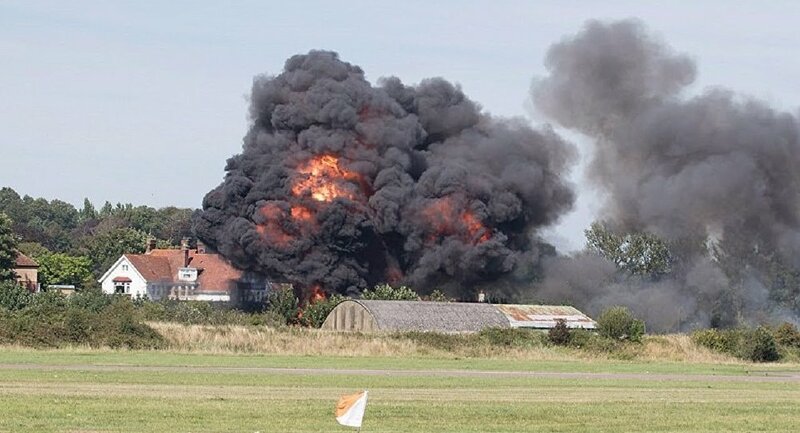 Earlier Hill had admitted he made a mistake during another airshow at Southport, near Liverpool, and said he had held his hands up to Civil Aviation Authority official George Duncan. He also said that in 2014, when flying his own home-made RV8 plane at the Shoreham airshow, he had failed to perform a manoeuvre properly and had been forced to fly to the west of Lancing College but denied overflying it. ​On Wednesday, 13 February, Hill denied he had been prone to risky flying manoeuevre or had a "cavalier attitude" to risk. Hill, of Sandon, Hertfordshire, also denies "recklessly or negligently" endangering a Hawker Hunter G-BXFI contrary to Article 137 of the Air Navigation Order 2009. His trial follows an air crash investigation into how his Hawker Hunter aircraft crashed into the A27 at Shoreham during a stunt. The victims were Anthony Brightwell, Maurice Abrahams, Dylan Archer, Matthew Jones, James Mallinson, Mark Reeves, Matthew Grimstone, Jacob Schilt, Daniele Gaetano Polito, Mark Trussler and Richard Smith. The trial, being heard before Mr Justice Edis, continues.